Happy New Year friends! If you're looking to spice things up in your apartment but not in a major way, I definitely suggest using a sheepskin rug/throw to mix things up! In today's post, I'll be using the Genuine Sheepskin Rug Single Pelt, by Super Area Rugs, to demonstrate the versatility of a fur rug..
1. Wake up to fur under your feet! There's nothing worse then having to get out of bed and step onto a cold floor am I right? Well with a rug like the Genuine Sheepskin Rug Single Pelt, by Super Area Rugs, that won't be a problem. This piece is so incredibly soft and plush that waking up to those cold winter days won't seem so bad. Moreover, the rug doesn't easily slip, so you won't have to worry about any injuries. And of course, this type of rug also serves as a decorative piece! 2. Completely revamp the look of your couch. It may technically be a "rug," but it can also be used as a throw! If you drape it over one of the armrests, you can completely change the look of your couch. Not to mention, it'll also make an itchy door-room couch (like this one) feel softer and therefore more comfortable to sit in! 3. Give that 'ol chair a makeover. If you have an armchair that's stained or old, throwing a sheepskin pelt over it could be exactly what you need to rejuvenate it's appearance. For the purpose of this post, I took one of my dinning room table chairs and decorated it with my fur rug, which could also be a great option for when you have folks over and need more seating! Hope this post helps inspire you to add a little flavor to your apartment this New Year! When most people think of Etsy, they think "handmade jewelry," which is true, but there's so much more to Etsy than that! In fact, I'm about to tell you about two cute shops that will make all the difference in your re-decorating efforts! Personally, I've been obsessed with marble-like designs lately and I thought what better way to incorporate that into my re-decorating plans than with some coasters right? That's how DeLucci Resin Art (an Etsy shop started by Alyssa DeLucci, a childhood friend of mine) comes into play. Alyssa's Custom 4 Piece Resin Coaster Set are to die for! 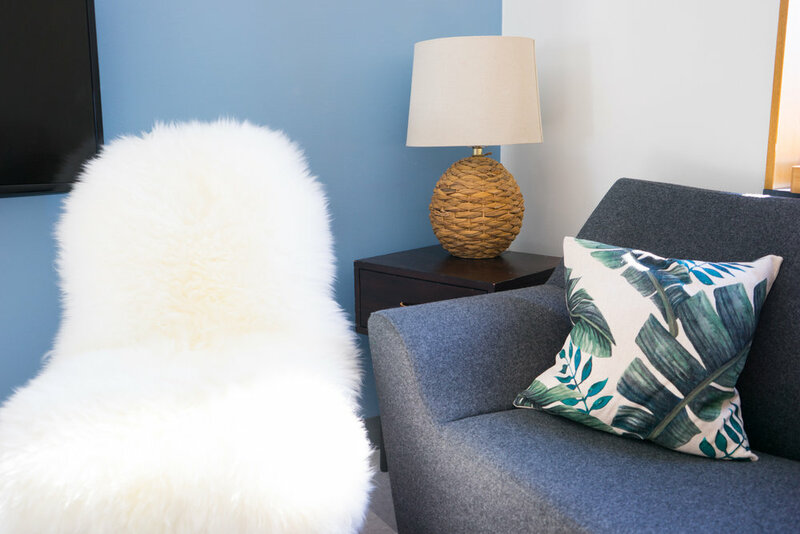 She worked with me to create a color scheme that would match my living area, and the results were stunning. The gold and silver design helps bring together my warm wood furniture with the cool grey hues in my couch and rug. Alyssa also makes phone cases, cutting boards, and leggings!! Be sure to check out the rest of her collection here. Another life-changing (a.k.a. room-changing) purchase was from another Etsy shop called, A Piece Of Bella. Aside from my love of marble, I've also been head over heals for the popular palm/tropical leaf theme. So when I stumbled upon this Palm Leaf Pillow Cover, I absolutely needed a pair for my living room. I'm happy to say that they bring some life to my otherwise minimalist living room. 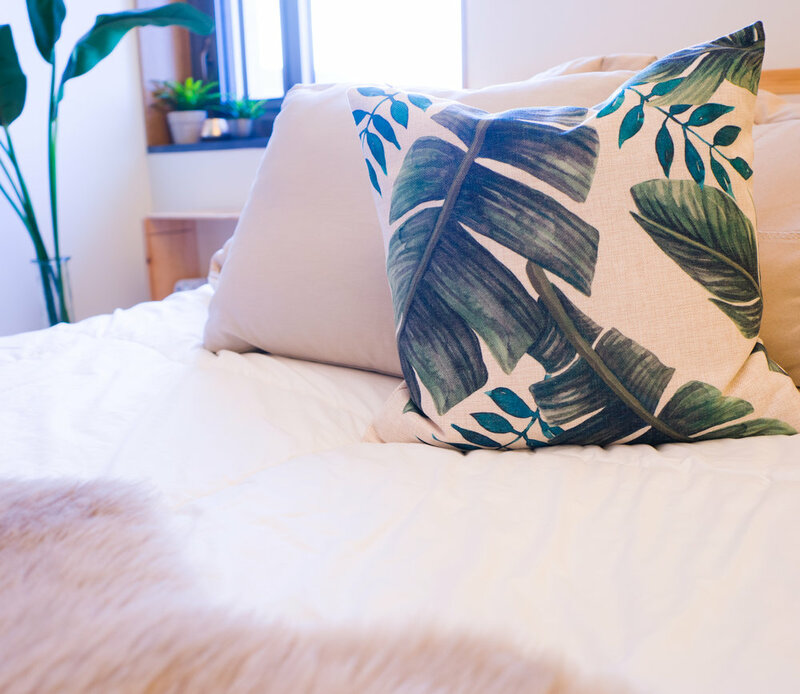 And if palm print isn't your thing, A Piece Of Bella has a huge collection of pillow covers to choose from that will surely spice up your seating areas! I was in desperate need of a coffee table and rug. Unwilling to pay the shipping charges at Ikea, I started perusing Amazon's furniture selection. And to my surprise I stumbled upon some great finds. I ended up going with this Laputa Mid Century Coffee Table and this Sweet Home Grey Shag Rug, both for great prices and free shipping! Now, I was a little wearing about the quality of the items, but after receiving them I have no complains at all. The coffee table is sturdy, trendy, and was very easy to assemble. The rug is soft and the light grey color was exactly what I was looking for to contrast the dark grey of my couch! So next time you're looking to change things up in your home, make sure to check out what Etsy and Amazon have to offer! As some of you may already know, I've been busy training to be a Graduate Associate (a.k.a. a graduate student who is a Residential Advisor in an undergraduate dorm). But with great responsibility... comes a beautiful one bedroom apartment (and a fulfilling job of course)! 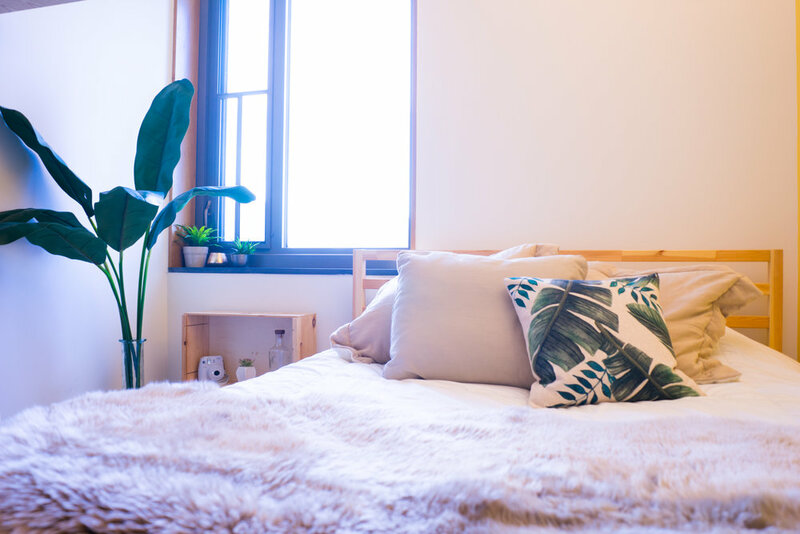 While I'll be discussing the rest of the apartment in another blog post, today I'll be focusing on the bedroom, which happens to be on the small side. Therefore, I had to think of some creative ways to decorate the place without making it look too cluttered. Basically what it boiled down to was me honing in on my minimalist skills and using already-necessary-bedroom-pieces as decorations. I have so much clothing that I knew it wouldn't all fit into the wardrobe that came with the room. 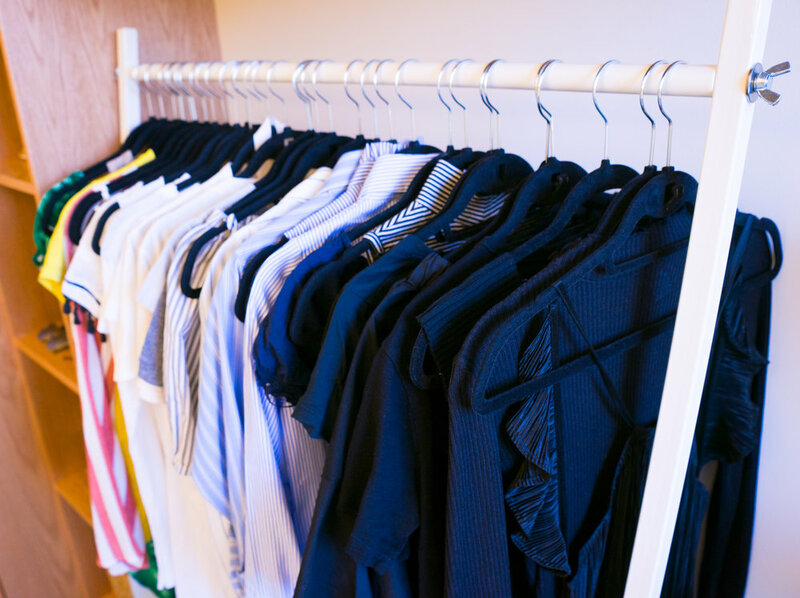 And so I enlisted the help of this sleek clothing rack, by Metal Works, to store my clothing, but to also make for a stylish decor piece! 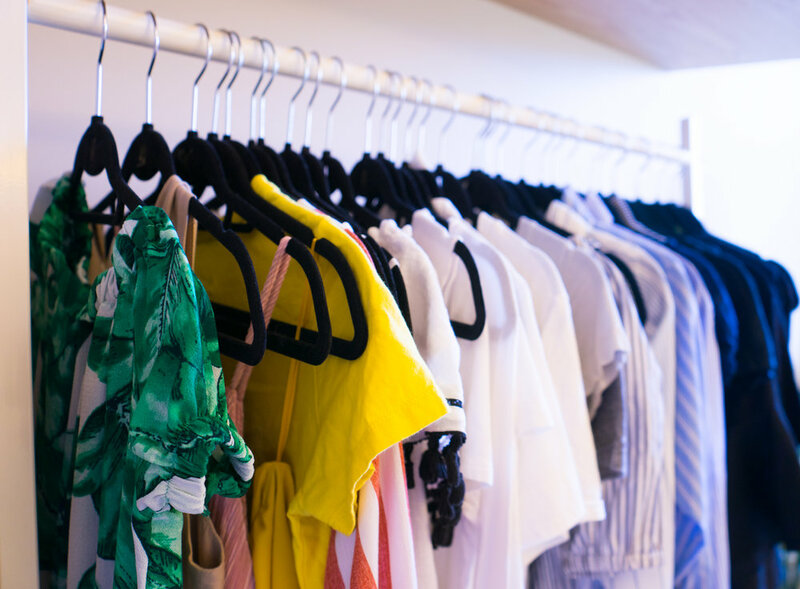 This rack has the minimalist design that I was looking for, with a white finish that would contrast nicely with my black hangers and colorful clothing. Not to mention, the rack was really easy to put together as there aren't many separate pieces to it! I love my queen-sized bed! But unfortunately, it takes up a lot of space. Therefore, with the help of a throw pillow, I decided to use some of that space to display a beautiful print. I chose to go with the Palm Leaf Pillow Cover, by A Piece Of Bella! If you couldn't tell, I'm pretty obsessed with the whole tropical leaf theme. In fact, I used the same pillow covers in my living room to tie the apartment together. These covers are made with durable linen blend fabric which is quite smooth to the touch! You can never have too many pillows am I right? The bedroom came with this shelving unit, but it's definitely something you can do yourself. 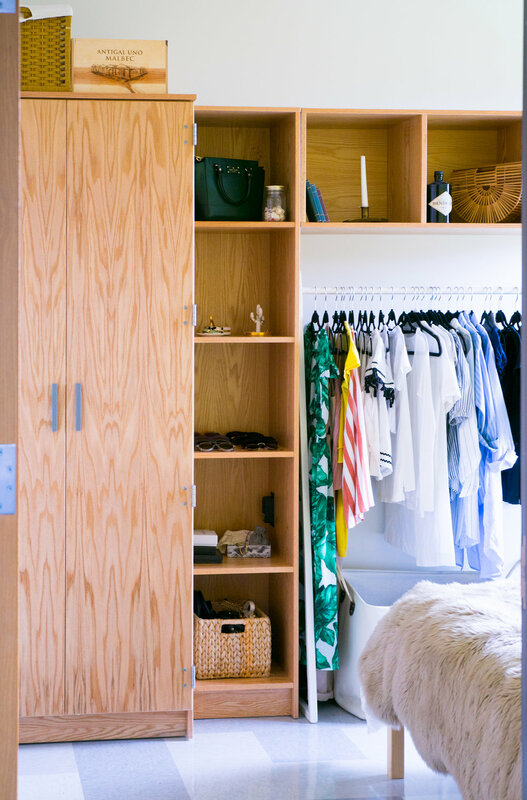 Shelves give you an opportunity to display decorative pieces, like my many candles, as well as accessories, like purses, sunglasses, and jewelry, without taking up too much space. Instead of buying a plain old nightstand, I decided to use two wine crates as make-shift, minimalist nightstand. Plus, it serves as more shelving to display decorations! But again, I used every-day items as decor, like my Fujifilm Instax Mini 9 (more about this camera to come)! Basically, it's about working with the space you have and making ordinary home items into decorations!